Card Text Action: If your opponent has 6 or more, steal 1 . 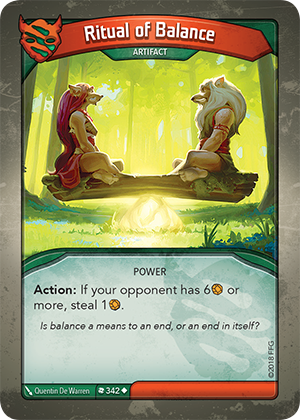 Flavor text Is balance a means to an end, or an end in itself? Can I use Ritual of Balance’s “Action:” ability even if my opponent doesn’t have 6 Æmber or more (for effects like “Each time you use an artifact, gain 1 Æmber”)? Yes, as long as you resolve as much of the ability as you can. If there are no valid targets for the artifact’s ability, the artifact would become exhausted, the ability would not resolve, and it would be considered used for the purposes of other card abilities that trigger when an artifact is used.